Oofos are Not just for the Endurance Athlete. In the workplace, I know many of us have felt like a seasoned athlete with our knowledge and ability to manage and serve and care for others in our chosen profession. With the physical demands of the day your feet deserve relief and a chance to recover. Dr. Bronwyn Wilke, DPM, FACFAS , gives us her thoughts about why a recovery shoe is an important addition to your footwear wardrobe, “ In an era when so many professions – industry, factories, retail, healthcare, mail carriers – that require extended time on your feet, a recovery shoe is key. 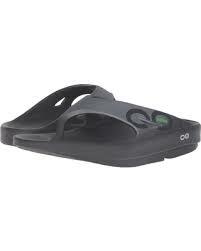 Oofos were originally designed for endurance athletes but they are needed by Industrial athletes a s well. If you spend more than 6 hours or take more than 10,000 steps at work daily, your feet deserve relief and a chance to recover. A recovery shoe can help prevent overuse injuries from daily pounding on hard surfaces”. Do you take over 10,000 steps and work over 6 hours where you work? You may be an Industrial Athlete, a term to describe the many professions industry, factories, retail, healthcare, mail carriers that require many hours on their feet. Give your feet a break to recover with Oofos, a recovery shoe with proprietary foam, providing 37% more shock absorption than a traditional midsole foam. Oofos allows your weight to be displaced to the side and gives your feet, ankle, knees hips and low back and whole body a break from impact. Arch support is important to protect the knee, hips and lower back on all plain of motion. The Oofos proprietary material is durable and articulates with the ground changing the game on how we see Recovery Footwear. 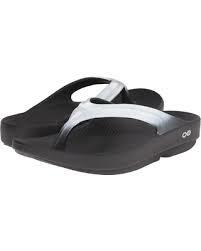 At The Right Shoe, we are happy to offer Oofos, Recovery Footwear to give your feet relief after a hard day at work. Styles available Oolala sandal, streamlined silhouette with a narrow last. The Ooriginal Sports sandal in a traditional thong sandal perfect for both men and women. The OOlala Sport is a slip on slide sandal offering the same recovery technology and comfort . The OOcloog is a traditional clog with recovery technology to absorb the impact of every step.